I’m talking about the huge fishing areas of South Louisiana. From the east side of the Mississippi River around Hopedale to Calcasieu Lake south of Lake Charles Louisiana, there are literally thousands and thousands of saltwater lakes, creeks, ponds and canals and most hold fish the year round. Louisiana has the most liberal daily limits in the country – 5 Redfish and 25 Trout per person per day. 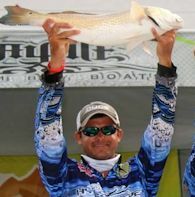 The slot limit for Redfish is 16 to 26 inches and you can keep one over 26 inches for a trophy. Speckled trout have to be at least 12 inches and have no upper size limit. Because the area is so big, I recommend that on your first trip to the marsh you use a local guide. The average water depth across the marsh is 4 feet, with some lakes as shallow as 2 feet. It’s easy to get lost, stuck or damage your boat, so choose someone with local knowledge to help you get started. Your friends at Mark’s Outdoors can help you with the rods, reels and tackle that you will need to have a successful trip. 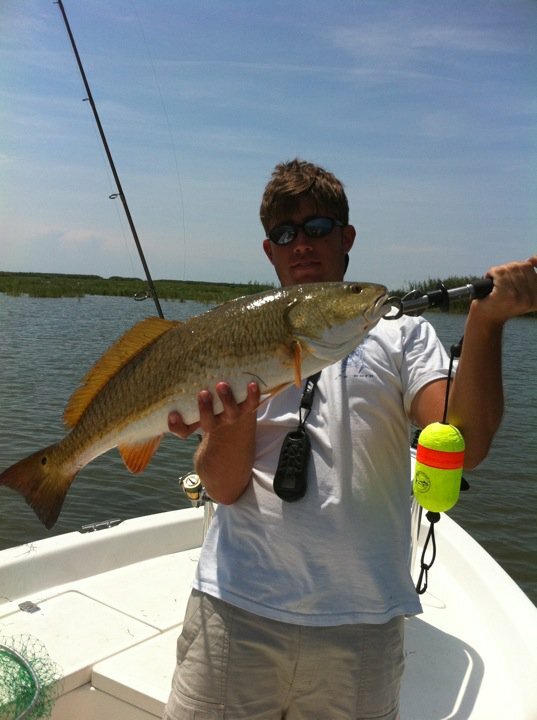 Redfish have four very distinct feeding and migration patterns; trout have two. The very best time of year for both fish is April through June. That’s the time of year that the water in the Gulf of Mexico warms and the brown shrimp start to move into the shallow waters to spawn. The trout and the redfish follow them in and it’s an absolute feeding frenzy! You can see trout and redfish chasing the shrimp to the surface and smashing into them! Any topwater bait will work that splashes or rattles, and the bigger the lure, the bigger the fish! If you have a passion for fly fishing, this is also your best time of year. The third pattern, early and late fall (September to November) for both redfish and trout is unique because both fish tend to “school up” in open water. Much like striper fishing, it is not uncommon at this time of year to catch 75 to l00 trout and never move your boat! The redfish will also school up, but tend to travel, popping up to feed, then moving a half a mile away from where you saw them. This time of year we “fish the birds.” When sea gulls spot shrimp close to the surface, they start diving. Then it’s usually not long before the trout and reds move in. For the trout we use a 1/4 ounce jig head and split tail sparkle beetle tied under a popping cork. The popping cork imitates the noise that a shrimp makes when scoots across the surface. For schooling reds we almost always use gold spoons, primarily because of the distance that they can be thrown. I said almost, because for those of you that love the thrill of a topwater explosion, this is your time of year! Throw any top-water bait into schooling reds and they will fight each other to get it. It is not uncommon to see a fish with a topwater lure in its mouth and another trying to get it out as you reel it closer to the boat. This is not for the weak of heart! The fourth pattern, winter (December to March) redfishing is one of the hardest, but can be one of the most rewarding, too. Leave all the lures at home, break out the Carolina rigs, Texas rigs and the popping corks. Don’t leave the dock with out several pounds of dead shrimp or live minnows. I know how some people feel about bait fishing, but when nothing else works, I want to catch fish! As the water cools, the fish on the Louisiana coast bunch up and find deep-water canals or deep holes. When I say deep I’m only talking about 6- to 8-feet of water. That’s deep considering that all year these fish stay in less than 4 feet of water. At this time of year we fish “slooooww.” Once you find them, reds or specks, they will usually stay in that area all winter. We are blessed with one of the most healthy estuaries in the world. We have an abundance of fish and other wildlife. You don’t have to be an expert or always have just the right conditions to catch fish. 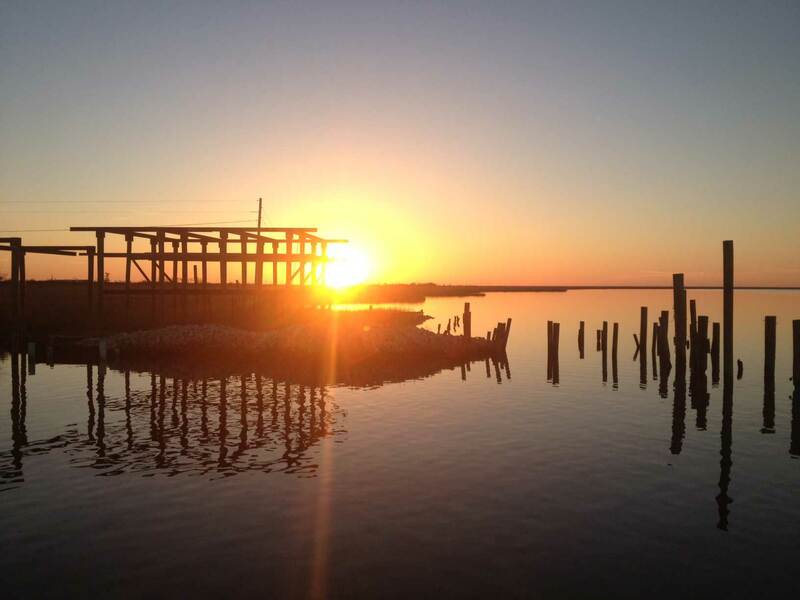 That’s why in south Louisiana we say, “we don’t go fishin’, we go catchin!” There is one last thing that I have not talked about and that’s the beauty of a south Louisiana marsh, when the sun is breaking over the horizon and the clean fresh smell of the saltwater fills the air. There is endless marsh grass and always the anticipation of what’s around the next bend. Some people say it’s unbelievable, I guess you’ll just have to come see it for yourself.